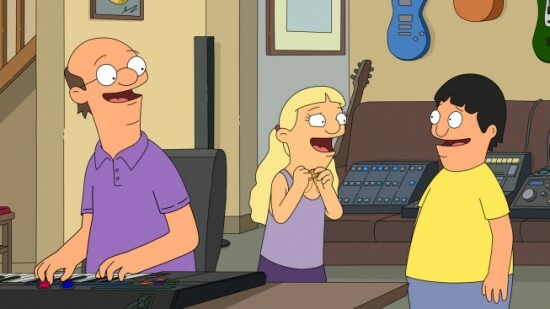 Oh, the Belcher children—they grow so fast. It seemed like just last week Tina was learning to drive in “Tina-rannosaurus Wrecks,” and now Gene is dealing with his first romance in “The Unbearable Like-Likeness of Gene.” Where does the time go? Much like the end of the second season, the third season is focusing on some of the individual kids. Early this year, that led to episodes like “Beefsquatch” and “Bad Tina,” which had their moments but didn’t have as much oomph as these character-specific episodes do. These two have done a great job of starting with a simple problem, then increasing the intensity in a way that is so ridiculous, but feels completely natural in the Bob’s Burgers universe. Consider last week: Tina got in a minor fender-bender, which ended with her burning down a house; she assisted in insurance fraud, and the episode culminated in the Belcher children pretending to drown in their over-flooded basement. This week, a girl named Courtney—who likes to chew on her necklace consistently and is voiced by the great David Wain—tells Gene she “like-likes” him. Not sure of what to do but under pressure from Courtney and her friends, he says he like-likes her too. The two start dating (or dating as much as you can at that age), even though Gene can’t stand her. When Gene goes to break up with her, he meets her dad, a jingle writer he mistakes for Moby who has an entire room filled with musical gear. It’s Gene’s dream come true. Gene sticks with Courtney to use her father’s equipment, but at Courtney’s birthday party, he’s had enough, telling her he doesn’t like-like her and that he wishes she would quit talking and quit breathing. She does, leaving her in the hospital, where once she recovers, Gene apologizes for using her. There’s also a side-story where Linda goes on the Skin Deep diet, which involves only eating the skins of fruits and vegetables. It doesn’t really go anywhere; Linda starts the diet, starts to go crazy from it and then gives up, chasing after mashed potatoes with her pants around her ankles. But it’s always fun to see Linda go insane and do things like try to eat her daughter’s hair due to starvation. “The Unbearable Like-Likeness of Gene” might also have one of my personal favorite moments in the show’s history. Bob drives Courtney, Gene and two of their friends for a double date to the movies (playing at the movie theater: Mister Sister, Ninja Nannies, Nora’s Beans and my favorite, Dog Prom 2). After Courtney constantly kicks his seat and denies it, Bob tells Gene that he needs to break up with Courtney. Then Bob does something incredible: he tells Gene that they can just leave Courtney at the theater and not come back. It’s such a simple thing, but it’s a great moment. It’s also Gene not being completely insane and real in his indecision. When Gene is dragged away by Courtney, Bob just whispers to Gene, “I’m so sorry!” It’s a great bonding moment between Bob and Gene and a great scene that doesn’t rely on the usual hijinks. This week’s Gene-centric episode isn’t as great as Tina’s brilliant driving mishap, but the two work well together under the theme of the children growing up and the entire family having to deal with their decisions and problems. I like that the Belchers are calmer this week, dealing with Gene’s problem and helping each other out. That’s the best part of the Belcher family. They may be a bit crazy and occasionally go days without eating anything but fruit skins, but they care about each other and always want to help each other in any way they can—especially if that means they never have to spend time with Courtney again.